In an effort to help our environment, we are taking steps to "Go Green." 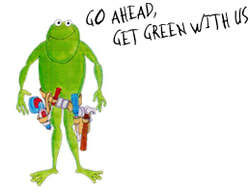 Interested in going green with us? Laysville Hardware has joined the call2recycle network to become a collection site for recycling rechargeable batteries & cell phones. We have expanded our selection of Compact Fluorescent Lightbulbs (CFLs) and can now accept and recycle your used CFLs. Paperless billing is now available — we can send your statements by e-mail. Email us or stop by to sign-up. Switch your incandescent light bulbs to CFLs and you will save $30-$60 over the life of the bulb (on average 10,000 life hours which is about 5.5 years if the light is on everyday for five hours). to my garbage what have you done? Before it was just one. My problem is space — where does it go? In fact, I have no place for four bags at all. They were the primary source. And my spirits that have sagged. For my kitchen sure looks like a dump!